I first read this book about ten years ago, and for some reason it didn’t stick. I could only recall one thing about it in detail: a trail of blood winding its way through a rustic Latin American town. Re-reading it now, I’m surprised more of it didn’t stand out for me, as the story is bristling with rich, poetic images. 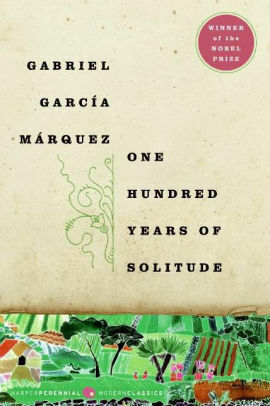 One Hundred Years of Solitude is the story of a family, but it’s also the story of a town, as the Beundias and Macondo are inextricably linked. From Macondo’s founding by the Beundia patriarch, José Arcadio, to its foretold destruction, the town holds the Beundia family at its turbulent center, and the fate of one feels reflected by the fate of the other. The story is complex and roughly chronological, with regular lurches forward and backward in time. The structure creates a sense of disorientation, which increases with the introduction of each new generation, which inevitably takes the names of some or all of its predecessors. There’s some realism to this, as family names are common, but I can’t help but feel that it was also a deliberate choice by Marquez to underscore the cyclical, Sisyphean nature of the family’s struggle. In any case, the profusion of José Arcadios and Aurelianos can be a challenge at times, not least because the family’s prodigious longevity and propensity for becoming ghosts can mean that five or six generations are in the story at the same time. As with all translated books, I hesitate to comment about the prose, since it comes to me filtered ,but in this case I can only say that it reads beautifully, with lush, loping sentences overflowing with imagery, reaching nearly half a page at times. Bursts of absurdist humour leaven the largely tragic story, which, alongside the vicissitudes of life and death in a hardscrabble rural village, covers such pivotal events as war, political upheaval, and the encroachment of colonialism. All told, it’s a brilliant book, and one I’m surprised I didn’t connect with more strongly the last time. Max Boot’s book was fine, but The Bridge of San Luis Rey was a lovely palate cleanser after a dense tome on warfare—not simply for its slender page count, but for the spare, breathy urgency of its prose. Wilder wields a fleet style that I admire in no small part because I just can’t do it. His writing isn’t colloquial, but it gains its literary sheen without becoming comma-clotted and dense. It sits at the opposite end of a spectrum counterbalanced by Thomas Wolfe and WIlliam Faulkner, and while I can rival neither of those masters, I am much more an eager (if incompetent) disciple at their feet. With Wilder, I don’t even know where to start. The book is interesting in structure as well as style, a quasi-religious meditation on causality and faith. The eponymous bridge lasts barely an instant, collapsing in the very first sentence only to be raised repeatedly through jaunts backwards in time. 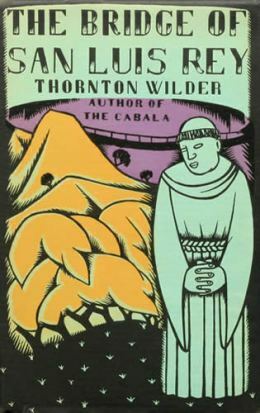 Five people fall to their death while attempting to cross it, and a devout friar named Brother Juniper seeks out every detail of their life in hopes of summising some grander purpose that will prove the existence of God. Most of what follows is a biography of the five ill-fated individuals, with particular focus on three of them: the Marquesa de Montemayor, an epistolary savant pining after her indifferent daughter; Estaban, a man grieving his lost twin brother; and Uncle Pio, an avuncular figure managing a tempermental actress. Their stories intersect in different ways, some of which seem to defy their own causality (Im not sure if this is a deliberate effect, an error on Wilder’s part, or simply a result of my own misreading). Each chapter inevitably ends with the bridge’s collapse, lending a strange air of fatalism to the proceedings. A great book. I’ll read more from him one day.